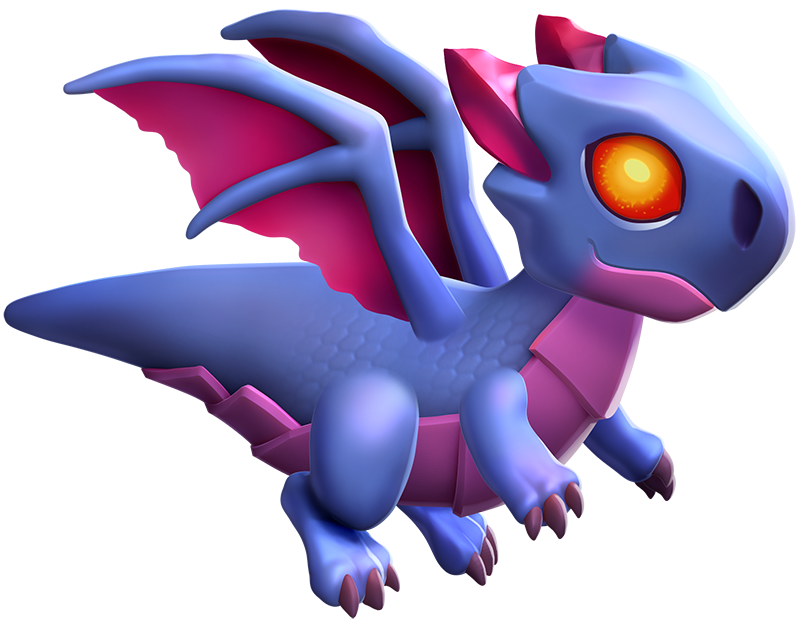 Introduced in Update 1.1, Chronos is a special Dragon, which is sealed in a statue on top of the Main Island, and has the power to speed up various timers in the game. Chronos can not be purchased, bred, used for breeding, or used in battle. It produces no Gold and has no stats, Elements and rarity, and does not have an entry in the Dragon Codex. Chronos is unlocked by exploring the ruins and finding and forging all the missing shards of the Chronosian Seals. Once all of them are forged, Chronos will be unsealed from its stone statue and will begin decreasing timers whenever its power is used. Chronos is named after the Greek mythical being of time. Whilst sealed, Chronos is encased in pale gray stone and is covered in patches of undisturbed snow. Its seals lost within each ruin are seen scattered beneath it either simply etched into the stone platform, or glowing a faint white or teal depending on whether or not the relevant seal has been forged. Its posture appears stoic and strong, its large wings held up proudly. Once all of its seals are forged, Chronos' stone body begins to crack, starting with its head, and it begins to shake violently with the force of unleashing. It glows a brilliant white before finally breaking free, stretching its wings before flying straight up into the air, returning to its mountain platform, and letting out a victorious roar as it remains stationed there for good in its unleashed form. 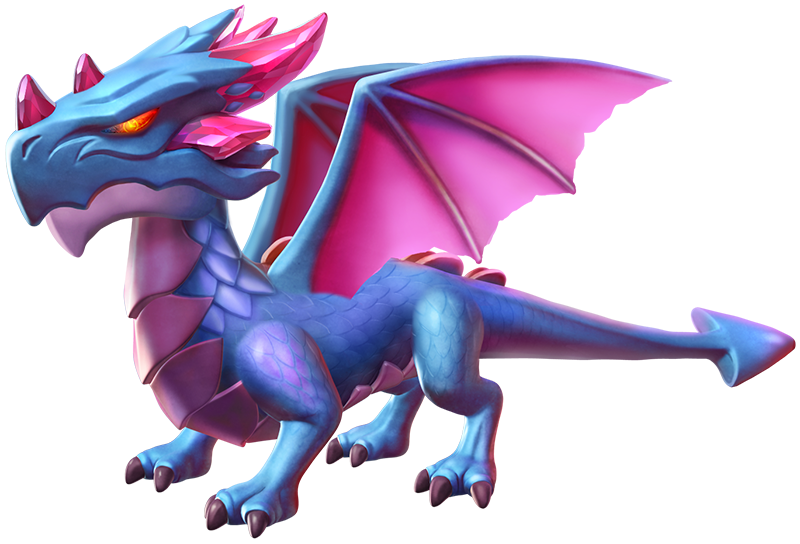 It now bears the resemblance of a blue Western-style dragon, quadrupedal with a set of wide, magenta wings. It has three large claws on each foot. It has two of the same-colored spikes on its wide muzzle and several more on the back and sides of its head. Its narrow eyes glow red with white irises. Both the front of its throat and belly are coated in large, armor-like pale pink scales. The end of its tail sports a triangular point. When it chooses to use its powers to speed up time, Chronos leaps into the air to hover briefly, before with a single flap of its wings begins to perform several reverse aerial flips around the image of a standard clock whose hands move quickly around it. It lets out a roar in the air before sedately returning to its station at the top of its mountain, its task performed, at which time it must rest for a few days. Chronos acquires a Chronoid each time the seals are forged again and its powers grow. The Chronoids themselves appear to closely resemble their larger counterpart, though there are a few subtle differences - and they are all identical. Their muzzles are noticeably shorter and rounder and their bodies in general are stockier. The color of their eyes is the same as Chronos' but are more almond-shaped, and have fewer, blunted spikes on the back and sides of their heads. They have pink, armor-like scales covering the front of their throats and bellies. They have three small claws on the ends of their feet. Their short, wide tails taper to a point. As they fly around Chronos, they leave behind starry purple flight trails. The Chronoids have no power and serve no other purpose, other than an aesthetic enhancement to Chronos itself. Chronosian Seals: Reassemble and collect all six seals found in your islands Ruins to unleash the great dragon, Chronos the Timekeeper. Together you'll be able to Decrease Timers! Chronos can be unsealed by collecting six seals from the ruins. Each ruin has three shards of a certain seal, which must be collected through repeated visits to the ruin and each shard has a different chance of being obtained. The shard will be awarded in addition to normal rewards. The current collection of seals can be accessed by selecting Chronos and then pressing the button underneath it. There, the Trainer can see how many shards of a seal they have collected and they can choose to forge them once all shards have been collected through the button and then confirming the choice through the button. If a seal has missing shards, the button will be shown instead and pressing it will take the Trainer to the ruin from where shards for it can be found. Once all the seals are forged, the button is made available after selecting Chronos' icon. Whenever each piece of a seal is found, it affects the appearance of the platform around Chronos' statue. Once Chronos is unsealed or leveled up, the seals can be found again, thus the platform around its statue returns to its initial state until shards are found again. Each time all the three shards of a seal are collected, the ability to forge the respective seal is given. When a seal is forged, all currently running timers will decrease by 6 hours. regardless of Chronos' level. That timer decrease can only be used when a seal is being forged and can no longer be used once the seal has been forged the maximum number, namely five times. Thus, there are up to five single-use timer decreases per each seal up to a collective total of thirty times. 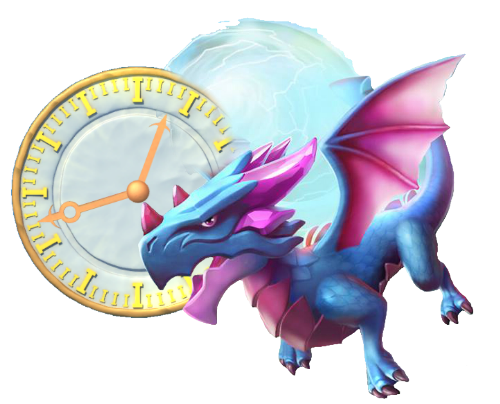 Time-involved processes that are affected by forging seals or the power of Chronos include breeding, hatching, growing Food, unlocking and building/upgrading buildings, unlocking and exploring ruins, awakening secondary Elements, training in the Dragon Academy, clearing obstacles, the Gold Vault cooldown, ascending Dragons and Fountain of Youth-related activities. 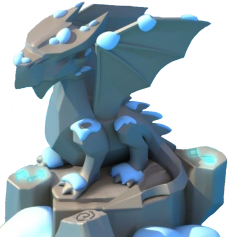 Conversely, the timers unaffected are the replenishing of the Battle Energy on the Campaign Map and in the Dragon League, the refilling of keys as well as the recovery time for Dragons in the Enchantment League and absolutely anything related to Clans. 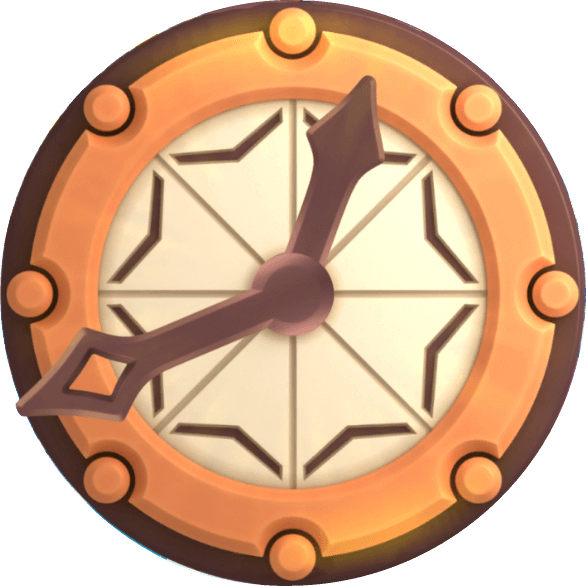 Additionally, Chronos' power does not speed up the Gold production nor affect the reset time of Daily Tasks, Daily Prizes, Clockwork Dungeon, Side Quests, gifting, or prizes that can be given in exchange for watching videos once every several hours. Once all six seals are forged for the very first time, Chronos can be released from the statue. Chronos, in its initial state, has the ability to decrease all time-involved processes by 6 hours every 4 days. This ability can be used unlimited times. Once the ability is used, the cooldown timer until it can be used again will be shown underneath Chronos. Selecting Chronos and pressing the button underneath it will bring up a window displaying whether or not Chronos can use its power. If the power is available for use, the option will be made available for that purpose. Otherwise, the window will display the remaining time until the power can be used again. After Chronos used its power and a seal can be reforged in order to make use of it, that seal will not reduce Chronos' cooldown timer. Additionally, forging the last seal needed to unleash Chronos from its statue will not speed up the time, thus using Chronos' power for the very first time will count as using the effect of the last forged seal. Chronos can be leveled a total of four times, by finding the Chronosian Seals again through exploring ruins, with each level decreasing the cooldown time of its power by 12 hours. Thus, at Level 2, the cooldown is 3 days and 12 hours, at Level 3 it is 3 days, at Level 4 it is 2 days and 12 hours, and at Level 5 it is 2 days. Update 2.7 introduced the Chronoids and the ability to level up Chronos. The clock that appears whenever Chronos uses its power has been slightly altered and the option now appears next to Chronos' icon whenever it is selected. Starting with this update, pressing the button only shows the collection of seals while the screen for activating Chronos' power has been moved under the newly-introduced button.